A bishop of Mesopotamia, about the year A.D. 277 to whom is attributed a Disputation with Manes, a prophet. Are Christian martyrs of the third century. Perpetua (born in A.D. 181) was a 22-year old married noble and a nursing mother. Her co-martyr Felicity, an expectant mother, was her slave. They suffered together at Carthage in the Roman province of Africa. Pope from A.D. 251 to 253 and Martyr, elected during a lull in the persecution under Emperor Decius, his pontificate was complicated by a schism, one cause of which was the self-appointment of the Roman priest Novatian as antipope and the second, the dispute over the Church's attitude toward Christian apostates and whether those who has repudiated the Christian faith during persecution needed to be re-baptized. North African; bishop; biblical scholar, martyr. Catechist of the church of Alexandria, in which see he succeeded Heraclas in the year A.D. 247. Of his numerous works but a few fragments remain. The best edition is that published at Rome in 1796. He flourished in A.D 258. Cappadocian; bishop, contemporary of Gregory Thaumaturge, ardent admirer of Origen; remembered for the moral support he gave St. Cyprian of Carthage on the issue of baptizing heretics. Also known as St. Gregory of NeoCæsarea, and Gregory the Wonderworker. 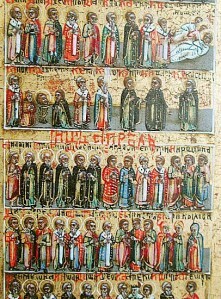 From Asia Minor; bishop of Cæsarea, built up the Christian Church, extended its influence, and strengthened its institutions, student of Origen. An Alexandrian by birth, was appointed bishop of Laodicea in the year A.D. 270. He was one of the foremost scholars of his day in the physical sciences as well as in Aristotelean philosophy. An early Christian author, the goal of his writings was to present Christianity in a form that would be attractive to philosophical pagans. From Asia Minor; bishop, Ecclesiastical writer, martyr. He succeeded to the chair of Alexandria about the year A.D. 312. He was the first to resist the heresy of Arius, whom he condemned, and whose against novelties he wrote numerous letters to the bishops of various churches; only two of these remain. Also known as Anthony the Great, Anthony the Abbot, Anthony of the Desert, and Anthony the Anchorite: He was Egyptian and a prominent leader among the Desert Fathers. The biography of Anthony's life by Athanasius of Alexandria helped to spread the concept of monasticism, particularly in Western Europe through Latin translations. Spanish; Bishop of Cordova, in Spain, foremost Western champion of orthodoxy in the early anti-Arian struggle, suffered for the faith, and was present at the Council of Nicaea. An Ecclesiastical writer who flourished about A.D. 270, and who suffered martyrdom probably in A.D. 303, under Diocletian. Appointed Bishop of Cæsarea in A.D. 314, Roman historian, exegete and Christian polemicist, scholar of the Biblical canon who was deeply embroiled in the Arian controversy. Priest, martyr and chief among Catholic Biblical scholars of his generation. He was born in Cæsarea of Palestine, about the middle of the third century. His apology for Origen was composed whilst he was imprisoned; only a portion of it remains in a translation by Rufinus. He was the friend and teacher of Eusebius of Cæsarea. The successor of St. Julius I in A.D. 352. He suffered severely from the Arian party, and was, for a time, alienated from St. Athanasius. Syriac; surnamed the "Persian Sage", born of pagan parents, After his conversion to Christianity he embraced the religious life. Italian; bishop of Cagliari, distinguished himself as a strenuous opponent of the Arians. He died about the year 371. His works, which consist almost solely of a few pieces addressed to the Emperor Constantius, are given by Gallandius in his sixth volume and from the Tillius edition. He is venerated as a Saint in Sardinia. Egyptian; bishop, theologian, and Doctor of the Church. He was present, as an assistant to St. Alexander of Alexandria, at the council of Nicea who he succeeded in A.D. 326. During more than forty years he was the champion of orthodoxy, and suffered much severe persecution from the Arian party. Also known as Gaius. A Roman presbyter distinguished by numerous writings, of which a few fragments only have come down to us. a writer against the Arians. Is said to have been a priest and Christian apologist of Jerusalem, and to have flourished about the year A.D. 266. A priest of the church of Antioch, during the reigns of Emperors Claudius II and Aurelian, was a well-known rhetorician most notable for his key role in the A.D. 272 deposition of the heretical bishop of Antioch, Paul of Samosata. The only remaining writing we have is a letter describing the evil conduct of Paul. the ("Life of Cyprian") shortly after Cyprian's death around A.D. 258.